The new Venezia shower enclosures comes different frame colors and glass types to perfectly fit into the specific interiors of different bathrooms and their sturdy designs as well as smooth finish also help in providing a durable and long lasting finish. The enclosure is easy to clean & helps it last much longer than usual. 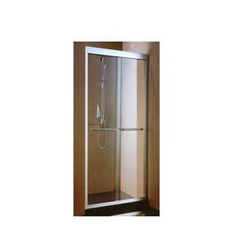 We offer Glass Shower Enclosure to our clients. A custom shower enclosure can add a new dimension to any bathroom. Shower Enclosure specifically designed to cater to the modern lifestyle that striking visual effect, allowing your bathroom color choices to pop against the brightness of the glass. Description : Simplistic and sleek, the M SERIES is practical and easy to install. The components of one bolt, one roller and one nut are packaged in a box and come fully equipped with a simple step-by-step instruction guide. We are highly engaged in offering an exclusive assortment of Home Shower Typical to our valued clients with the strongly support of professionals. An uncompromising selection of materials and precise finishing guarantee long life. Single-layer safety glass ensures high impact and shock resistance as well as maximum safety.